PS: It’s OK Arnold, I don’t mean you. Let’s face it, we all love the world of cruising. If I wasn’t such an admirer, I wouldn’t be sitting here writing this. If you, the reader, weren’t a devotee, you wouldn’t have this magazine in your hands right now. It doesn’t take long for holidaymakers to become a fans of cruising, and when they do, they can get pretty obsessed. You join Facebook groups sharing a common interest with other fans. After travelling on a couple of voyages, you begin to form a collection of your favourite ship, your favourite destination, and of course, your favourite cruise people. The cabin steward who went out of his way to make sure a shirt was laundered and pressed in time for formal night. The waitress who remembered – after just one night on board – that you want no more than two ice cubes in your gin and tonic, lime rather than lemon, and it simply has to be Tanqueray. Accept no substitute! You might have a favourite cruise director or spa therapist. You’ll certainly be well on your way to having a favourite captain, and if you’re a woman of a certain age who has travelled with one particular British cruise line – the one that has been painting giant Union Jacks on the bows of its ships – there’s a good chance it might be Robert Camby. chocolate and whatever other magical ingredients are required to put that plate in front of you, the chances are you’ll never even think of them. But if you ever did get the chance to meet them, you would waste no time showing your gratitude and telling them how much they were appreciated. There’s another group of important people in the cruise industry who seem determined to remain friendless – although they should be the ones for whom the highest praise is reserved. I’m talking about the highly-paid cruise line executives who should be going out of their way to make friends and influence people, but in fact do the complete opposite. Many of them were together in Hamburg last month for Seatrade Europe– a combination of trade show for cruise ports and ship suppliers, and high-flying conference for movers and shakers. The opening State of the Industry session should have provided these masters of the maritime universe with an opportunity to show they were the good guys – bringing pleasure to millions of holidaymakers in an unimpeachable way. Instead, they turned the event into a depressing moanathon. No-one was safe from their barbed complaints. Port authorities were criticised for being slow to adapt to provide the finest facilities for the visiting ships and passengers that bring welcome revenue. International authorities were blamed for imposing onerous visa requirements that deter applicants from going through with their plans even after they have made the big decision to fly from, say, China to the Mediterranean. (Visa requirements which, in my experience, do nothing to deter queues of voracious Chinese shoppers at Bicester Village in Oxfordshire). Governments across the continent came under fire for making life difficult for these cruise bosses – if it wasn’t employment legislation they would prefer to ignore, it was restrictions on the heavy fuel which can be bought (relatively) cheaply and which help prevent fares from rising to unaffordable levels. The fuel is problematic because it is dirty, and throws out some pretty obnoxious smoke and chemicals. Instead of vowing to do everything in their power to clean up their act – and their ships – the Hamburg mob could only bristle at the way different governments were inconsistent in their application of the European Union’s clean air directives. If there is a lesson for the cruise line executives to learn from the crisis that blew up in the face of car maker VW a few days later, it is that you ignore emissions at your peril, and that the public is almost wholly on the side of the clean-up brigade. It’s slightly ironic that the much-criticised Carnival Corporation – branded Carni-vore by some –is at the forefront of cleaning up the cruise lines’ act. They are building the first ships to be powered by more environmentally-friendly LNG fuel – liquefied natural gas. 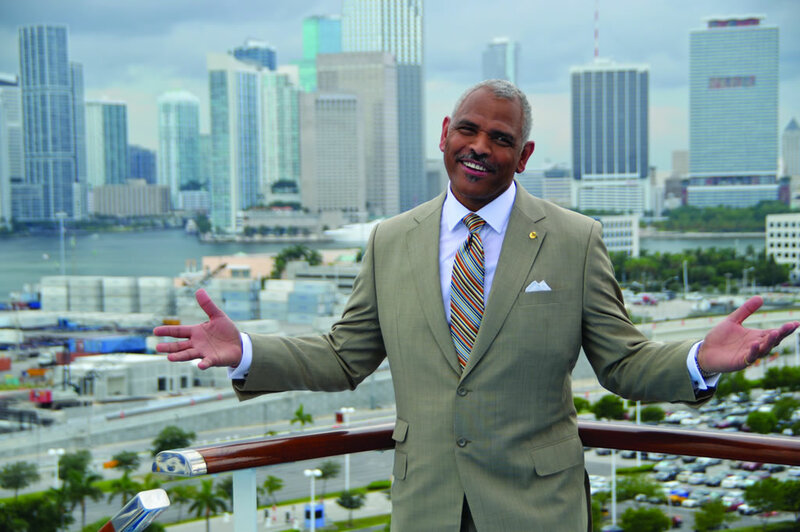 Unlike the grandees in Europe, their American-based CEO Arnold Donald was prepared to admit, a few days later, that the refugee crisis is having a harmful effect on cruise bookings – with some passengers even asking if their holiday could be disrupted if their ship had to be diverted in order to save lives. Back in Hamburg, those executives entrusted with the stewardship of major cruise corporations had tried to ignore the refugee problem. Using their other complaints as a diversionary tactic, they even attempted to assure their audience that it was not something anyone needed to be concerned about.